Why choose fillers lip enhancement? As we age our lips lose their full youthful appearance becoming lined and thin. 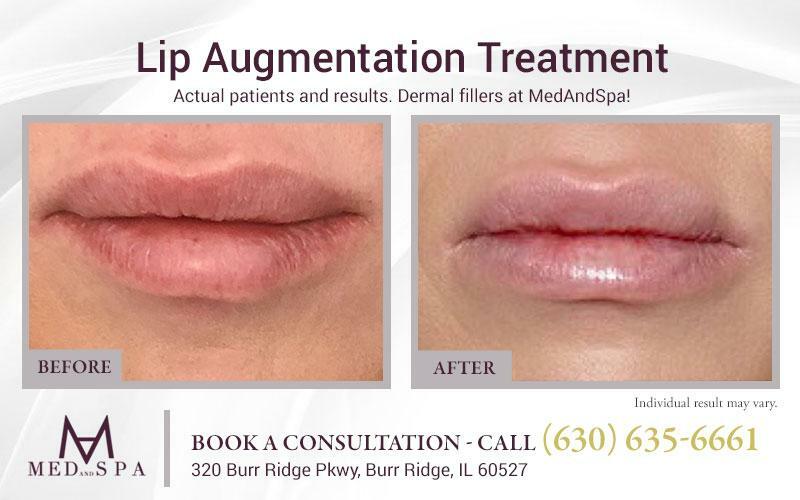 Patients from the age of 18+ can repair and enhance their lips with MedandSpa’s lip augmentation treatment. Now you can restore volume loss & improve your facial balance. After one simple lip filler treatment you will see immediate results making you look younger, softer and sexier. What does lip enhancement do? Filler lip enhancement from MedandSpa will restore volume on thin or aging lips while improving the symmetrical appearance between upper & lower lips. Most patients see improved vertical lip lines and a reshaped cupids bow after just one simple treatment. MedandSpa is the premier medical spa in Burr Ridge, Illinois. We pride ourselves on complete customer satisfaction and offer a free consultation so that we target the best injectable fillers for your particular physique. What services do we offer at MedandSpa? Our certified nurses are highly trained in lip enhancement treatment. We offer the latest injectable lip treatments to bring your lips back to their full, firm, plump youthful state. We offer these top rated lip fillers. What results should you expect from MedandSpa’s lip augmentation treatment? Who is the best candidate for lip enhancement treatment? Patients in good overall health of every age from 18+ can dramatically improve the appearance of their lips and restore their youthful appearance after just one simple sesssion. Lip augmentation is not suitable for patients with blood-clotting issues, Lupus, oral infections (like herpes), diabetics or allergies to substances such as lidocaine. Call MedAndSpa today at (630) 635-6661 for your free lip augmentation consultation and restore your youthful look! !